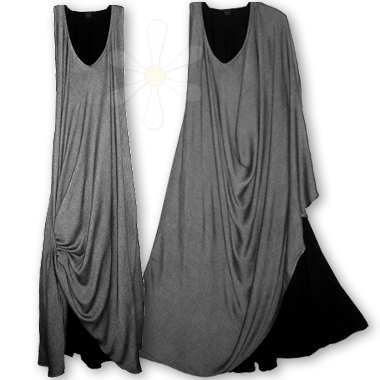 Our EXTRA-gorgeous two-layered dress in RARE form: a layer of our special non-metallic silver over solid black! This is the SAFI, which is sleeveless, has 8" deep side pockets, MILES of flowy fabric... and the whole thing drapes and flutters like a desert dream on so many shapes and sizes! For measurements and details about the SAFI style, visit our main page here.